HA NOI (VNS) — Vietnam Airlines' first Boeing B787-9 Dreamliner, with the airline's new corporate identity and brand image, landed at Heathrow Airport in London on Tuesday, marking the airport as its first international destination. Addressing a ceremony marking the event held in London, Viet Nam Ambassador to the UK, Nguyen Van Thao, said the launch of the new jet by Vietnam Airlines would better serve as an effective bridge linking people of Viet Nam and Britain, adding that it was most befitting that the flight coincided with the fifth anniversary of the two nation's strategic partnership this year. Thao also hailed the Vietnam Airlines' astonishing development with the launch of flights to Heathrow Airport in March and now the launch of the new jet. 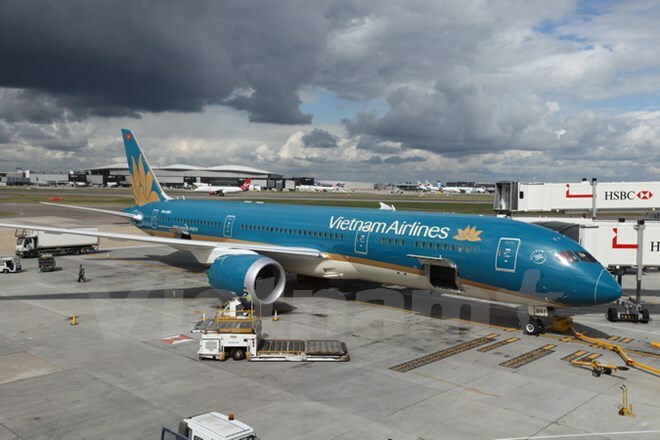 Head of Vietnam Airlines in the UK Le Thanh Dung said Vietnam Airlines were excited about being the first airline to operate the new B787-9 Dreamliner nonstop between Southeast Asia and Europe. Vietnam Airlines currently serves the English capital four-times weekly, with two departures from Ha Noi and two from HCM City. This will increase to five or six-times weekly following the deployment of the Dreamliner, and eventually become a daily service during the Summer 2016 season. The Boeing 787-9 Dreamliner is equipped with a business class cabin with flat seats that recline 180 degrees, dynamic LED lighting, larger windows, spacious stowage, as well as cleaner, healthier air, and lower cabins, all of which will subdue tiredness during long trips. In addition, passengers will be offered a pilot Wi-Fi service on Boeing 787-9.